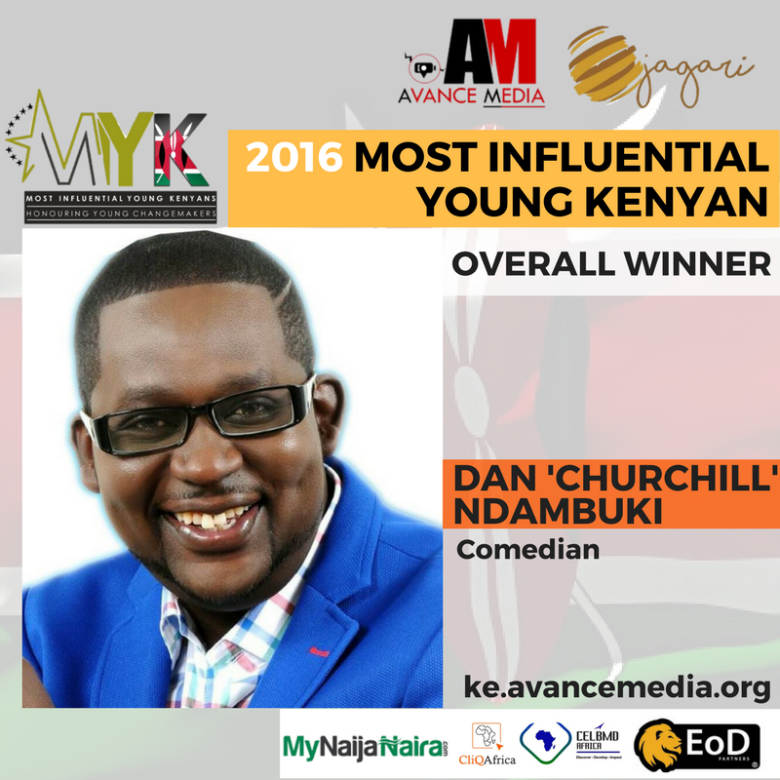 Comedian and lead host of the comedy TV show Churchill Show, Dan ‘Churchill’ Ndambuki has been voted the 2016 Most Influential Young Kenyan in a public ranking poll spearheaded by reputable rating establishment Avance Media and Jagari Designs. Dan popularly known as Churchill has made great strides with his career in Comedy and Television making him a great role model and influence to young people in Kenya and abroad who also voted him as the Most Influential Young Kenyan Entertainer. The ranking which features 100 young Kenyans between the ages of 15 to 40 drew participation from over 80 countries from across the world that nominated and voted for the 100 nominees to make up the final ranking. Voted as the Most Influential Young Kenyan lady is the Personal Development Expert, Elsie Wandera who is the Founder at My Heart Scripted and Endometriosis Foundation of Kenya. Following Dan keenly on the ranking are Mshila Mwakai Sio, Elsie Wandera, Boniface Mwangi and Johnson Sakaja. Science & Technology: Mshila Mwakai Sio – CEO, Agua Inc.
MD of Avance Media, Prince Akpah extended his appreciation to all who participated in the ranking and encourage young people to learn from the exploits of the influential young people who made the final ranking. Head of Creative Designs and Founder at Jagari Designs, Janerose Gatobu shared that it was time for young people to rise up as great leaders in their various sectors and know that being great leaders is not about age but about being a great influence and inspiration creating tremendous impact to the society. She also added it is time to be on the lookout for the young trendsetters ready to shake up their spaces as she congratulated all the nominees and all the people that took part in the rankings. 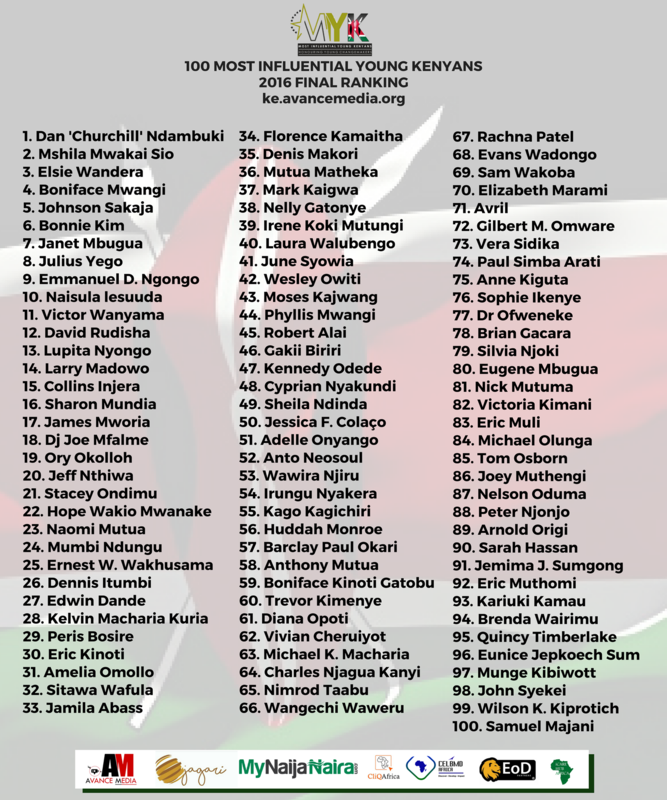 Below is the Official 2016 Ranking of 100 Most Influential Young Kenyans. The 100 Most Influential Young Kenyans is an initiativeof Avance Media and Jagari Designs in partnership with ReputationPoll.com, TANOE, EOD Partners, CELBMD Africa, My Naija Naira, Dream Ambassadors Foundation GH, iCare Hub Africa, Global Skills Exchange, Core Foundation and Project Know Thyself International.